Today we had a slightly different job in the way of fitting a multipoint locking mechanism into a static caravan. 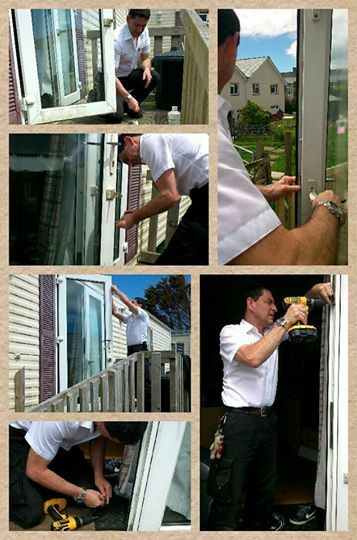 Many statics have the same sore of lock as the average Upvc d oor and as such the same maintenance is needed to prevent failure. Unfortunately, this caravan required a complete replacement as the centre case had failed due to the doors being out of alignment with the frames and the constant force being used to lock the door had caused internal failure. When we started we asked the owner “had they had to force the handles up in-order for the door to lock” and they stated no. Once we had changed the multipoint and realigned everything, the owner after trying it then stated “it was never this easy to operate” which just goes to show that you get used to having to apply to much pressure. We have added a lot of information to both the website and our face book page regarding this problem so if you have trouble operating any multipoint locks regardless of the age or type of door it is fitted into, get in touch with us for some free, no obligation advice and do not leave it until the system is in need of a complete and expensive replacement. AS A RULE: You should be able to GENTLY CLOSE the door without holding it and it should latch closed. THEN: Then you should be able to lift the handles with NO FORCE with one hand and then turn the key in the cylinder WITHOUT feeling any pressure or binding at all. If this is not the case, consult a locksmith for some professional advice.